This necklace is a hand-crafted one of a kind...and if you love dark, mysterious style, this one's for you!! BLACK MAGIC ROSES feature beautiful hand-crafted filigree of sterling silver that has been antiqued and set with 3 black onyx cabachons. The hand-crafted bezels have also been created to represent the jagged edges of the leaves, creating further interest. The focal sits beautifully and the design has been created to allow movement between the two sections of work so that the piece actually moves with you. BLACK MAGIC ROSES hangs from a black suede cord which further intensifies the overall look of the piece. This necklace is shipped professionally tagged and boxed -- perfect for gift giving! 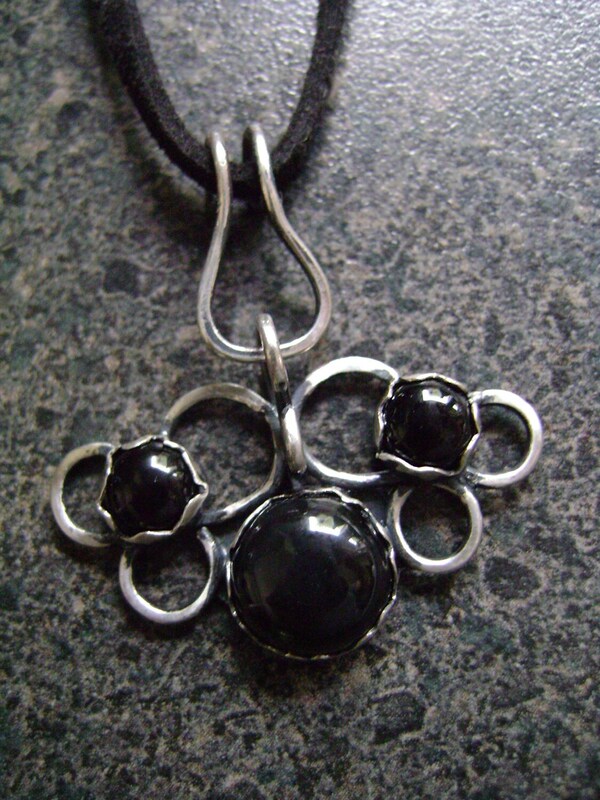 Since antiquity onyx has been used as a protection against black magic. It has been used for thousands of years for healing eye disorders. Onyx was considered one of the most important healing stones. It is particularly effective on the skin, healing infected wounds as well as fungal infections, inflammation and even sunburn. Onyx also works on the psyche, deflecting negative energy, increasing the wearer's stamina, and giving inner harmony. It promotes self-confidence and a sense of responsibility and helps its possessor achieve success. Chakra Classification: Onyx influences all the chakras.